Canadian’s New Food Guide Moving Away From Meat Consumption – Give it a try with us during Meat Free Week! In the past two decades, Canadians have shifted towards a diet which includes more fruits and vegetables, cereal products, and nuts and beans. 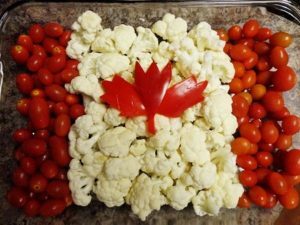 With more and more Canadians making the switch, it is no wonder that Health Canada just released its preliminary draft of Canada’s new Food Guide, the first such overhaul of the country’s nutrition policy in ten years. The changes are long overdue, say health care experts, many of whom see the proposal as a step in the right direction. Even though statistics in the last 3 decades show a steady decline in Canadian meat consumption, there are still many meat lovers that remain skeptical about making the switch despite the World Health Organization’s classification of red meat – including, beef, veal, pork, lamb, mutton, horse, and goat – as “probably carcinogenic to humans”. WHO found an even stronger link between processed meat – such as salami and hotdogs, and bowel cancer. Studies conducted by the World Cancer Research Fund show bowel cancer risk increases by 17% per 100g of red meat consumed per day and that bowel cancer risk increases by 18% per 50g of processed meat consumed per day. Read more about how you can reduce your bowel cancer risk. Try Going Meatless For a Week With Us! People around the world will be going meatless next week including all of us at Colorectal Cancer Canada for Meat Free Week (18th-24th September 2017). This new campaign challenges participants to give up meat for seven days and raise funds for a great cause. Going meat free for one week creates a great opportunity to start thinking about how much meat you eat and the impact eating too much meat can have. Everyone is invited to take the Meat Free Week challenge and discover how easy it is to make little changes that can create a big difference. Challenge yourself, your family, your friends and colleagues to give up meat for seven days. Sign up for Meat Free Week and raise funds for a great cause! Not able to participate, but still want to help make real change happen? Make a donation today. If you’re already living meat free, there are still plenty of ways you can get involved in Meat Free Week. + Meat Free Week: Live well. Eat well. Be well. •	Adopt a physically active lifestyle. •	Consume a healthy diet with an emphasis on plant-based foods. •	Maintain a healthy body weight. Are you following our healthy our foods that fight cancer program? Once you’ve made it through Meat Free Week, this is a great on-going support program that can help you eat better and live healthier. Check us out today via our website or facebook page! We are believers of FOOD. We want to empower Canadians to take charge & take over their health! So Welcome fellow food enthusiast! Learn about foods here, find your favorites recipes, invite your friends & family, and TAKE OVER your kitchen & your health! Print article This entry was posted by Kristah Halton on 14 September 2017 at 7:23, and is filed under Uncategorized. Follow any responses to this post through RSS 2.0. You can skip to the end and leave a response. Pinging is currently not allowed.